If he were lucky, no one would take exception to his disappearance. 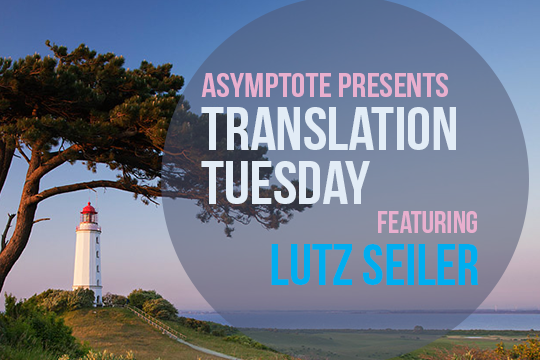 Today, we’ve partnered with Scribe Books to introduce the majestic German Book Prize winner Der Spiegel calls “the first worthy successor to Thomas Mann’s Magic Mountain to appear in contemporary German literature.” It is also the debut novel of Lutz Seiler, a major German poet we’ve published in our pages before. In the novel excerpt below, our protagonist has just arrived at a seaside town after an unspeakable tragedy. The true subject of this chapter is revealed to be Ed’s unsettled inner state—dive in and read all the way up to its heart-stopping end. He smelled the sea even before he got off the train. From his childhood (memories of their only trip to the Baltic Sea), he remembered the Hotel am Bahnhof. It lay directly across from the station, a big, beautiful attraction with oriels built as round towers, and weather vanes in which the numerals of the years crumbled. He let a few cars pass and hesitated. It wouldn’t be wise, he thought, especially as far as money was concerned. On the other hand, there was no point in arriving on the island in the afternoon, since there probably wouldn’t be enough time left to find a place to stay—if he could find one at all. He had about 150 marks on him; if he were careful, he could make it last for three, maybe even four weeks. He had left ninety marks in his bank account for rent transfers, enough until September. If he were lucky, no one would take exception to his disappearance. He could have fallen ill. Summer holidays would begin in three weeks. He had written his parents a card. They believed he was in Poland, in Katowice, for the so-called International Student Summer, as he had been the year before. The reception desk was built unusually high and looked as if it had been swept clean, no papers, no keys; but what did Ed know about hotels? At the very last moment, the heads of three women appeared, rising like the pistons of a four-stroke motor in which the fourth spark plug has failed to ignite. Impossible to discern from exactly which depths the receptionists had suddenly surfaced; maybe the high shelf of the desk was connected to a back room, or maybe over the years the women had simply got used to staying under cover as long as possible, quiet and still, behind their dark veneered barrier.